For the second week in a row, a major Miami invitational started the afternoon off with great weather; overcast with no sun, although the humidity was still kicking fairly hard. But the biggest difference is that for this week, the better weather was here to stay for all four races! 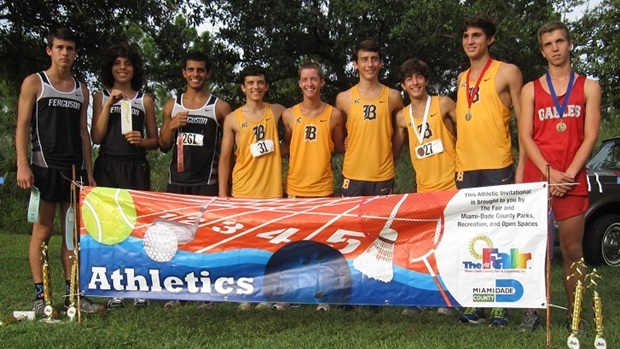 As for the racing itself, there was a very similar theme for both the boys and girls junior varsity races as both the Ferguson girls and Belen boys were able to secure an entire scoring team before the first ten athletes came in overall. 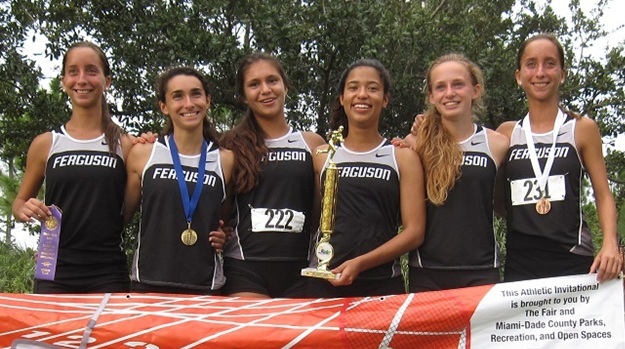 On the girl's side Ferguson placed six girls consecutively as they ran in 3rd through 8th places, while Belen placed five boys consecutively finishing in 2nd through 6th places overall. Both teams won by fairly good sized margins over the second placed schools, 64 and 44 points respectively, and both teams set up that winning mentality that their varsity squads could use as momentum going into their races afterward. 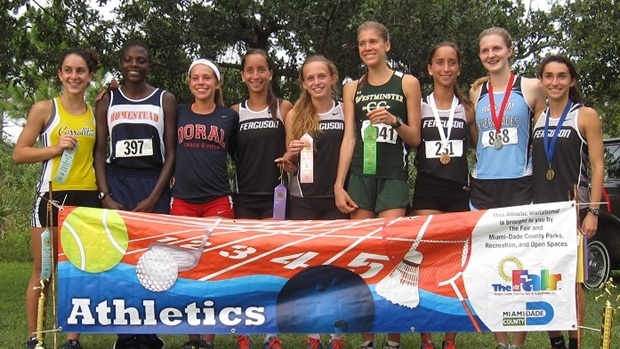 The 'top ten' junior varsity girls award winners, placing from 10th place, on the left, to 1st place on the right. The 'top ten' junior varsity boys award winners, placing from 10th place, on the left, to 1st place on the right. Heading into the girl's varsity race, the girls from John A. Ferguson were the heavy favorite for two main reasons. 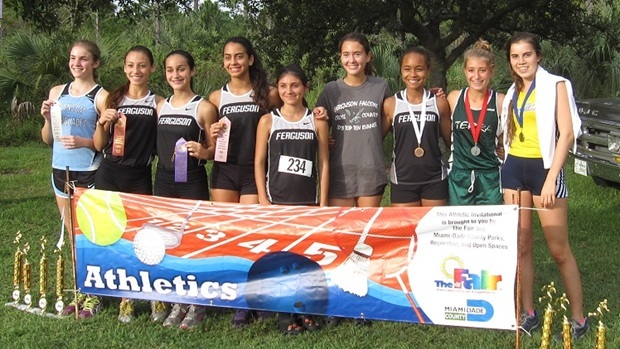 First, they're coming off a big win at last week's Ferguson Falcons Invitational, but secondly, and more importantly, last week's runner-up team, Lourdes Academy, held their varsity out of the competition as they are traveling up north to compete in the UF Mountain Dew Invitational on Saturday. But even without their main rivals in attendance, Ferguson put together a very solid race running in a tight pack with their top four through the halfway mark of the course hanging out in the 3-4-5-6 positions. It wasn't until the second half of the race that the girls broke apart a little bit, but they still managed four in the top seven with number five coming in 13th place securing the win. This was the third consecutive county championship for the Falcons. The runner-up team race was a much closer affair as Westminster Christian beat out Coral Reef by only two points, securing their trophy by working a nice 3-4-5 pack just a couple of places inside Coral Reef's fifth runner. The 'top ten' varsity girls award winners, placing from 10th place, on the left, to 1st place on the right. By far the most competitve race of the day, the boy's varsity competition saw eight boys breaking the 17 minute barrier with another nine getting under the 17:30 mark. 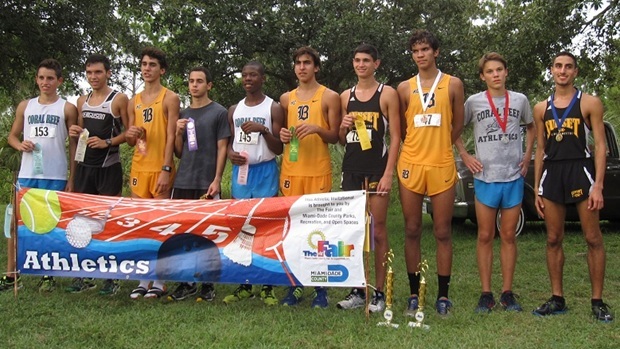 The top three teams went out hard from the beginning and through the entire race it appeared to be a toss-up as to what school would bring home the championship, either Sunset, Belen, or Coral Reef. In fact, within the top 14 overall places, only one athlete (Santiago Saiki of Ferguson) staggered into the athletes from these three squads. But when it was all said and done, the tell-tale story of cross country held true at this meet as it does at most others. It doesn't matter how good your first four runners are, championships are won with the back half of your varsity. So while Coral Reef just didn't quite have the fire power of the other two schools, and although Miami Sunset managed to outscore Belen 23-28 through the first four runners, the meet was won when Belen got their 5-6-7 inside the Sunset fifth. With that two-point edge Belen secured themselves another win for the record books. Amazingly all three teams had their team averages sub 17 minutes, which is quite a feat for any team at Larry & Penny Thompson Park. The top ten varsity boys award winners, placing from 10th place, on the left, to 1st place on the right. 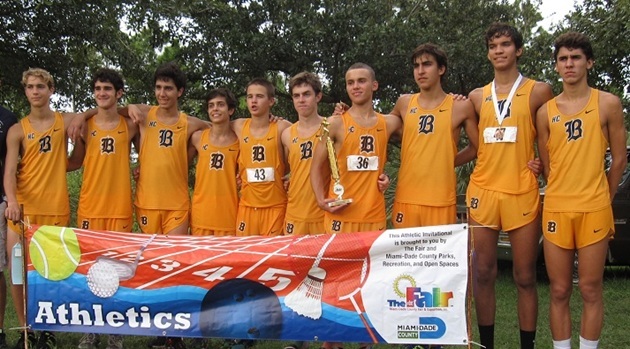 The boys varsity team champions from Belen Jesuit.